Also known as Diné College, Navajo Community College is a two-year community college located in Tsaile, Arizona, with branches in various towns across the Navajo Nation, an area of 26,000 square miles stretching over Northwestern New Mexico, northeastern Arizona, and southern Utah. Established in 1968, Navajo Community College was the first postsecondary institution in the U.S. to be under full tribal control. It was housed in Rough Rock, Arizona until 1969 when the Tsaile campus opened. In 1997, a decision was made to change the name to Diné College to better represent the institution's dedication to the preservation of Navajo/Diné history and tradition. 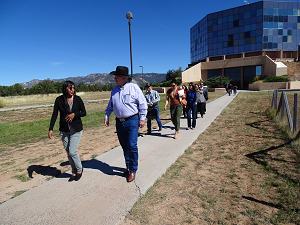 "Arthur “Butch” Blazer and colleagues on a tour of Diné College in Tsaile, Arizona, October 14, 2014" by U.S. Department of Agriculture is licensed under CC BY.